Professor Silk was certainly not alone in drawing this conclusion and I am not alone in noticing the graphic's potential for creating distortions. PRRI’s graphic simply highlights growing diversity of the U.S. population (i.e., "America the Diverse"). PRRI does polling on religion and politics and a common practice in that endeavor is to break out religious groups by race and ethnicity as there are often distinct political differences between people of the same religion who have different racial and ethnic identities. 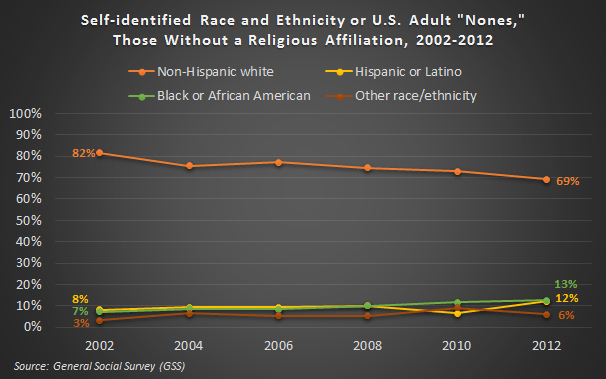 What the figure lacks is a break out of race and ethnicity for the “Nones” (...which is also understandable given that this sub-group tends to have very similar political attitudes regardless of race and ethnicity). 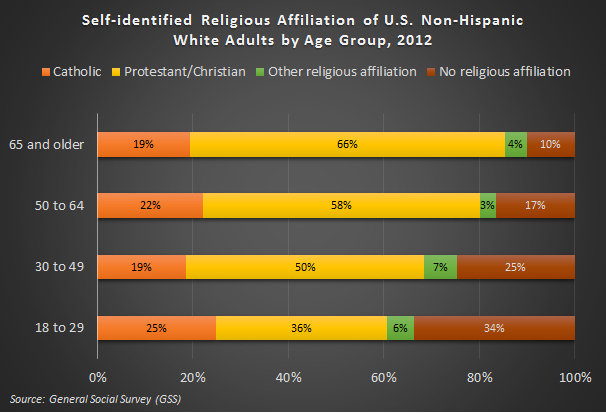 Are Nones disproportionately white (i.e., the children of Catholics and Protestants)? Not quite. Generational differences in a snapshot poll may not always really reveal a trend one seems to “see” in the data. First of all, a smaller proportion of people self-identify as non-Hispanic white among younger generations, as shown in the General Social Survey (GSS) data below. 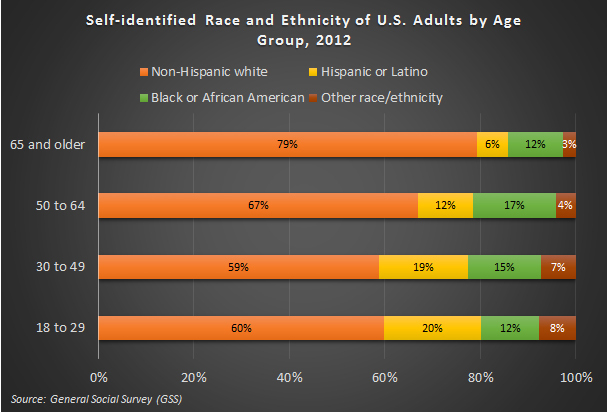 Much of the population growth in the U.S. in recent years has come among those self-identifying as Hispanic or Latino. This has primarily occurred through immigration and historically higher fertility rates. Despite a decline in percentages across generations, the U.S. non-Hispanic white population is growing in absolute numbers, just at a slower rate than the Hispanic population. With smaller proportions self-identifying as non-Hispanic white there will most definitely be smaller proportions self-identifying as “white Catholics,” “white Protestants,” etc. in younger generations. This has little to do with shifting religious identities and is not “White Christians turning into Nones” (...which reminds me of another instance when some commentators and reporters misunderstood percentages/graphics and concluded that Christians were "migrating from Europe to Africa, Asia and the Americas"). As the population becomes more racially and ethnically diverse, Nones are actually becoming less likely to self-identify as non-Hispanic white as well (82% in 2002 and 69% in 2012). Currently, one in four Nones self-identifies as either African American of Hispanic/Latino. Even though Non-Hispanic white Catholics make up a smaller proportion of all 18 to 29-year-olds than they do among all of those ages 65 and older in the 2012 GSS (14.9% compared to 15.3%) it is also important to point out there are actually more of these young Catholics in absolute numbers than the older Catholics. 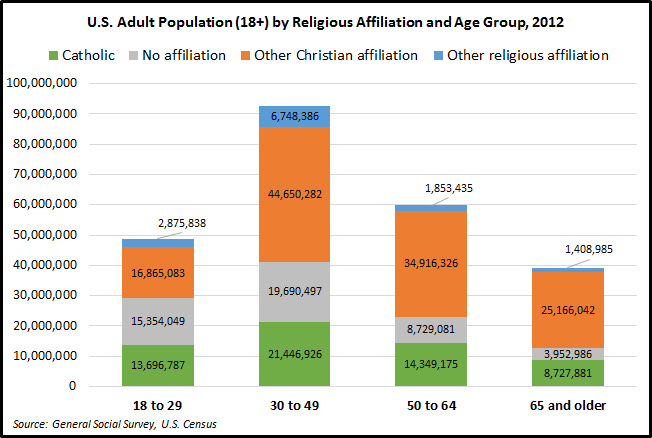 Using the GSS data and Census estimates there were approximately 7.3 million non-Hispanic white Catholics ages 18 to 29 in 2012 compared to 6.0 million non-Hispanic white Catholics ages 65 and older. Such is the nature of demography. People die (i.e., "exit the sample") and they tend to be older. The size of the pie (or bars in PRRI's graphic) for those ages 65 and older is simply smaller than the pie for those ages 18 to 29. "Conventional wisdom," many religion reporters, and even some researchers repeatedly claim that the Catholic Church is “hemorrhaging” members and we just can't see it because of immigration. In response, we’ve repeatedly pointed out that this hypothetical equation simply does not balance with immigration alone and that there has to be more to that story that goes ignored (1, 2, 3). Yet few ever seem interested in running the population numbers. What percentage of the adult Catholic population in the U.S. is foreign-born? (Pew: 22%, GSS: 26%). What percentage of former adult Catholics in the U.S., those who have left the faith, are foreign-born? (Pew: 18%, GSS 17%). Plug in these numbers (and more) and see how everything adds up. 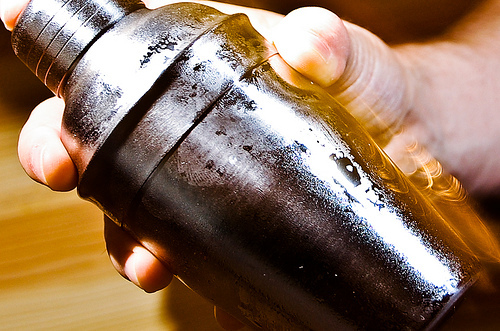 Make comparisons over time and see how different things are now from decades ago. Sometimes it takes a bit of demography and polling to see the clearest portrait of reality. 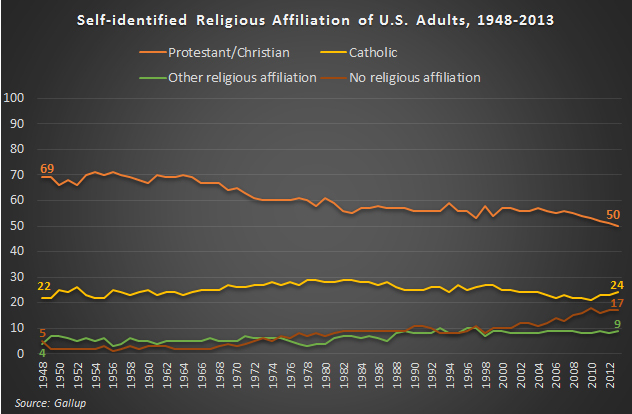 Right on time to test this point again is Gallup’s annual aggregated estimates of religious affiliation in the United States. How many years of the Church “falling apart” will it take for the Catholic affiliation percentage to decline (beyond margin of error)?... Reality can be so stubborn! Mixing image provided by RLHyde. The research note is from the Winter edition of The CARA Report. CARA has been releasing research in this quarterly print format for nearly 20 years, since 1995, and has won a number of awards for "general excellence" from the Catholic Press Association during this time. You can get your copy here. Following the procedure originally devised by the late Fr. 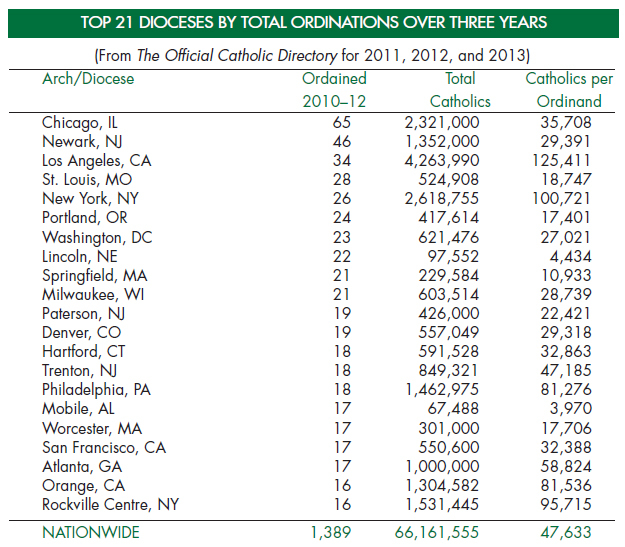 John Klein of the Archdiocese of Chicago, and using data from The Official Catholic Directory, from time to time CARA has reviewed the proportion of ordinations to the diocesan priesthood relative to the latest Catholic population figures for each diocese. Only Latin-rite dioceses that have had at least five ordinations during the reporting period are included. The tables here present the results of the latest review, for the three ordination years 2010–12 and using year-end Catholic population figures for 2012. 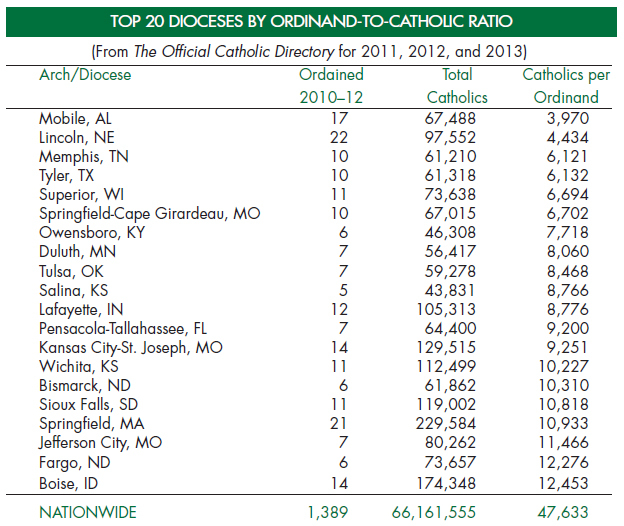 The first table lists the top 20 dioceses according to the priest-to-parishioner ratio; the second the top 21 dioceses (because of a tie) based on the largest absolute number of new priests ordained. At the other extreme, for the years 2010-2012, six dioceses with a total of almost 500,000 Catholics had no ordinations, and another 16 dioceses with almost 1,700,000 Catholics had only one new priest.